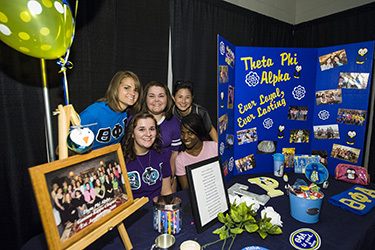 Interested in learning more about joining a fraternity or sorority at Wright State University? Complete this form to be connected with a Fraternity and Sorority Life staff member, or council officer. Someone will contact you with more information on how to join. Formal Recruitment at Wright State occurs during Fall Semester. Incoming freshman, transfers and upper-class women are welcome to participate in recruitment. We have several events leading up to recruitment. Move-in night Panhellenic will co-sponsor an event in the Woods basketball court. Music, dancing and some free food! Recruitment dates for 2019 are September 5(Orientation)–September 9 (Bid Day!). Interested women can register for recruitment. Fraternity recruitment begins on Move-in Day. 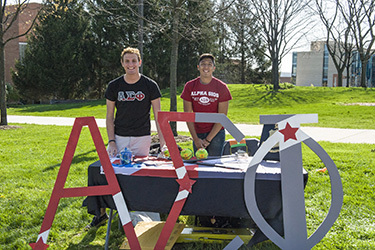 There are some great opportunities to get to know the men of Wright State's fraternities. Move-in night the IFC will co-sponsor an event in the Woods basketball court. IFC will host several other informational events in September where interested men can meet members from each fraternity. Following these events, each fraternity will host their own recruitment events. 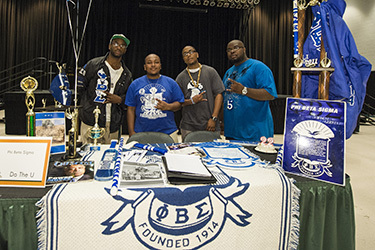 Intake of new members to NPHC organizations is unique because every individual organization has its own timeline and process for initiation. NPHC Organizations in 2019 will be hosting an Open Forum at the beginning of Fall semester on September 5th in 009 Student Success. This is a great way to meet the members of our Divine Nine organizations, and have some fun. Details coming soon!